This figure was taught to me by an Apache girl, Lena Smith, from Jicarilla, New Mexico, at the St. Louis Exposition in September, 1904. Lena spoke very little English and touched a door to signify the name of the figure. I could not get from her the Apache name. She was much amused at my blunders. A Navaho girl told me that all Indians know this figure. In the Philadelphia Free Museum of Science and Art, there are four examples of the finished figure collected by Mr. Stewart Culin and preserved on cards: (1) Li-sis = a Poncho, 22722, Navaho, from St. Michael's Mission, Arizona; (2) Pi-cho-wai-nai, 22604, Zuñi, New Mexico; (3) Pi-cho-wai, a-tslo-no-no-nai = a Sling, 22610, Zuñi, New Mexico, and (4), 22729, from Isleta, New Mexico. 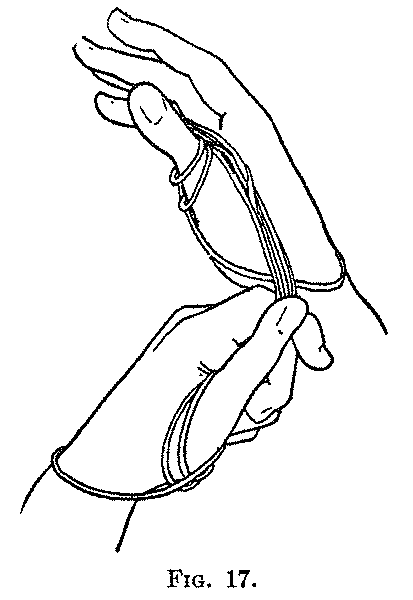 Second: With the right thumb and index pick up the left near index string close to the left index, and lift the loop entirely off the left index; then put the loop over the left hand and let it drop down on the left wrist. 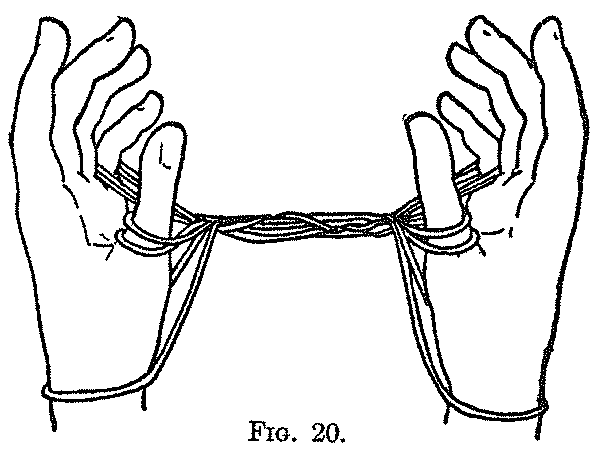 With the left thumb and index pick up the right near index string close to the right index, and lift the loop entirely off the right index; then put the loop over the right hand and let it drop down on the right wrist. Separate the hands and draw the strings tight. You now have a loop on each thumb, a loop on each little finger, and a loop on each wrist (Fig. 15). Third: With the right thumb and index pick up the left near little finger string (not the whole loop) close to the left little finger, and, drawing it toward you, pass it between the left index and thumb, and release it. With the right thumb and index pick up the left far thumb string close to the left thumb, and, drawing it away from you, pass it between the left ring and little fingers, and release it. With the left thumb and index pick up the right near little finger string close to the right little finger, and, drawing it toward you, pass it between the right index and thumb, and release it. With the left thumb and index pick up the right far thumb string close to the right thumb, and, drawing it away from you, pass it between the right ring and little fingers, and release it. 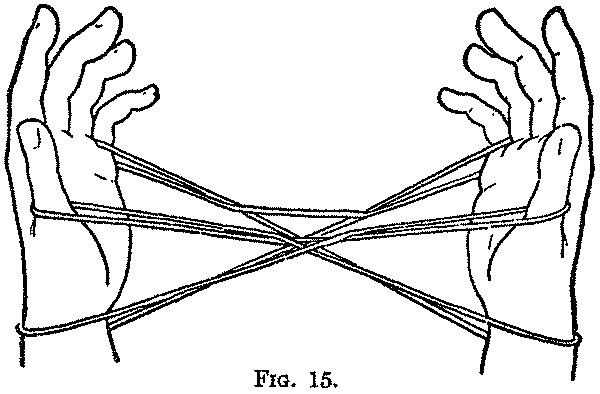 You now have a loop on each wrist, and two strings crossing each palm in the First Position (Fig. 16). 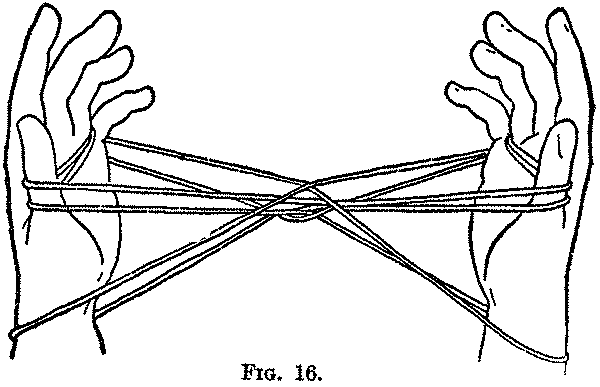 Keeping all the loops in position on both hands, with the right hand grasp tightly all the strings where they cross in the centre of the figure, and pass this collection of strings from right to left between the left index and thumb, that is, from the palmar side to the back of the hand, and let them lie on the back of the hand midway between the index and thumb; then with the right thumb and index take hold of the two loops already on the left thumb and, without pulling them out, draw them over the tip of the left thumb. Now, still holding these loops, let the collection of strings lying low down between the left index and thumb, slip over the left thumb to the palmar side. The left thumb is now entirely free. Without untwisting the two original left thumb loops, which you are still holding with the right thumb and index, replace these loops on the left thumb exactly as they were before the collected strings were placed between the left index and thumb. Separate the hands, and draw the strings tight. 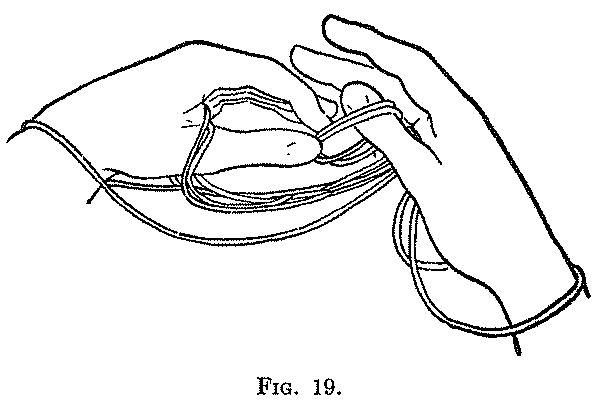 You now have a loop on each wrist, two twisted loops on each thumb, and two twisted loops on each little finger (Fig. 20). Fifth: With the right thumb and index lift the left wrist loop from the back of the left wrist up over the tips of all the left fingers, and let it fall on the palmar side. With the left thumb and index lift the right wrist loop from the back of the right wrist up over the tips of all the right fingers, and let it fall on the palmar side. 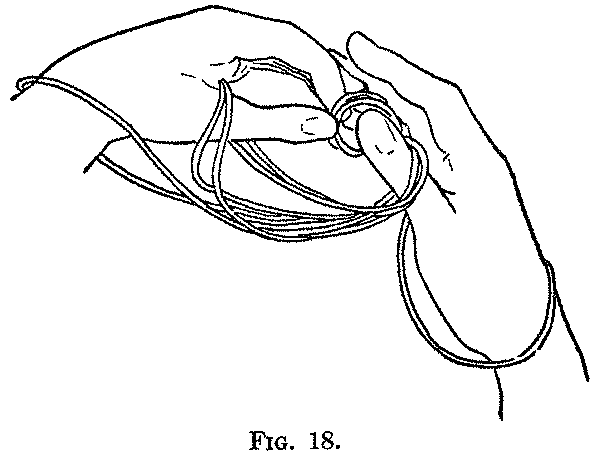 Sixth: Retaining the loops on the thumbs and little fingers, rub the palms of the hands together; then separate the hands, and draw the figure tight (Fig. 21). 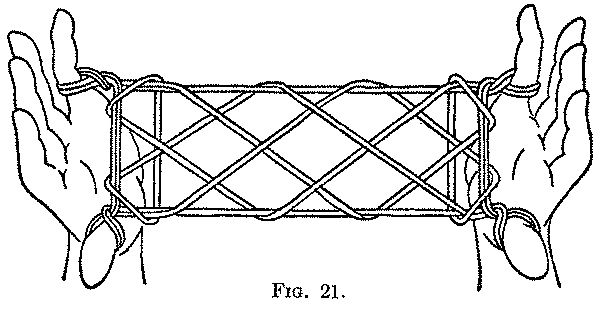 In the Second, the method of transferring the index loops to the wrists is unusual; as we shall see further on, a more complicated method is almost always employed. In the Third movement the changing of a string from one finger to another by means of the thumb and index of the other hand is a process not often observed. Indeed one may easily believe that the methods given in these two movements are short cuts peculiar to the individual who taught me the figure, and that, some day, other Indians will be seen doing these movements in the usual elaborate style, whereby the strings on either hand are shifted and arranged by the fingers of that hand only. As far as I know, the Fourth movement has not been observed in any other string figure. The rubbing of the hands together in the Sixth movement is, of course, only for effect; it has no bearing on the success of the figure. The manner of showing the finished pattern, what we call its "extension," is of the most simple type; indeed the figure practically extends itself when the hands are drawn apart.